EghtesadOnline: European Central Bank President Mario Draghi defended free trade and post-crisis financial regulation at the U.S. Federal Reserve’s Jackson Hole symposium, while avoiding any comments on monetary-policy deliberations or the euro exchange rate. The euro extended its gains, as some investors had hoped Draghi would try to talk down the single currency amid fears it’ll undermine the euro-area recovery. The single currency had already climbed to the highest level against the dollar since January 2015, and was up 1 percent at $1.1923 at 3:24 p.m. in New York, according to Bloomberg. The ECB chief also eschewed any comments that could be seen as prejudging the outcome of the Sept. 7 Governing Council meeting, when policy makers are planning to review their unconventional stimulus policies against the backdrop of strong growth but still-subdued inflation. 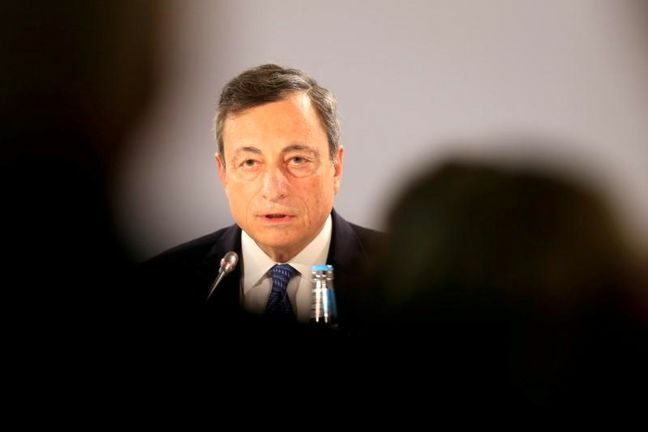 Expectations for Draghi’s speech were high in financial circles after the precedent set by the his previous appearance at the mountain resort in 2014. On that occasion, Draghi warned that inflation expectations were declining in the euro area, laying the groundwork for the start of quantitative easing the following year. Earlier on Friday, Federal Reserve Chair Janet Yellen defended the financial rules set in place after the global financial crisis, warning that any rollback should be “modest.” That point was echoed by Draghi in his speech.